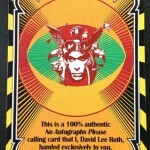 Personalized playing cards are David Lee Roth of Van Halen’s new celebrity autograph! That’s right – you heard me – David Lee Roth is now using custom playing cards -printed by Ad Magic – as a way of signing – well not signing – autographs for his fans and also to protect his signature from being re sold on ebay and other collectible sites. 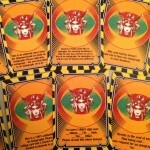 The colorful “Celebrity Signature” playing cards for David Lee Roth – the lead singer of Van Halen – are printed on a casino quality playing card stock and boast 54 unique individual cards with clever sayings that could only have been hand crafted exclusively by David Lee Roth himself. These custom playing cards are actually being handed out to fans as collectible autograph cards by the famous lead singer turned video show host. Based on what I have read printed on some of the cards, it seems to me that David Lee Roth has had a few issues arise with identity theft – specifically theft of his signature and resale of it on sites like ebay. Even though he apparently does not wish to continue to sign what are considered to be conventional autographs, these custom printed autograph type playing cards will allow the rock star to provide fans with a David Lee Roth memento to take away when they meet him.With 54 personalized comments on each of the custom playing cards faces, each card reflects David’s personality in a different way and can be handed out to an appropriate type of fan based on what the card actually says. Comments range from things like “Dude. 1984 called. It wants its ennui back” to “This is a 100% authentic No Autographs Please calling card that I, David Lee Roth, handed exclusively to you” to some others that I really cannot print here no matter how much I would like to. Fortunately for blogging purposes – the use of playing cards continues to evolve and change and develop into interesting new configurations as more and more people invent fascinating uses for them. With the continual rise in identity theft, the ridiculous prices of celebrity autographs online and collectible prices in general, it seems to me that the time for celebrity autograph playing cards is now. What a great way for famous people to take control of their own autograph situation while at the same time providing their fans with a unique take-away. Of course that doesn’t mean that even these personalized playing cards won’t ever be making an appearance on ebay – but at least they won’t affect David Lee Roth in a way he can’t “deal” with. Pun intended. Ad Magic has printed playing cards for celebrities before, including Neil Diamond, Jason MRAZ, the band Journey, Dave Matthews Band, Paulie Z,Rounder Records band The Time Jumpers, A custom chip set for Slash, a custom chip set for Justin Long (a gift from Drew Barrymore which we designed and printed) and a collectible card deck for the band Devo – to name a few.